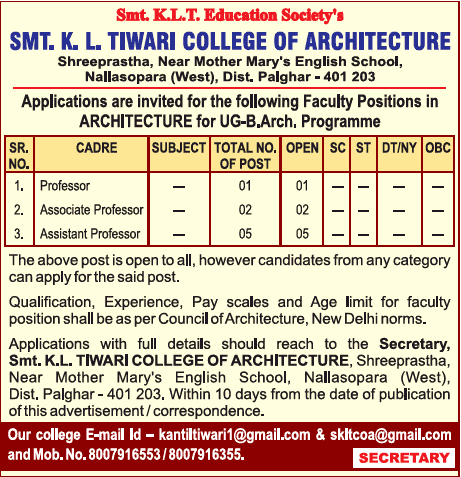 Smt.K.L.Tiwari College of Architecture, Palghar has advertised in TIMES OF INDIA newspaper for the recruitment of Professor/Associate Professor/Assistant Professor job vacancies. Interested and eligible job aspirants are requested to apply with in 10 days. Check out further more details below. About College: Smt. K.L. Tiwari College of Architecture focuses on developing professional skills of students and empowers them to make the most of their knowledge and realize their full potential for the growth of the society. The courses offered at the college aim to inculcate conceptual and analytical skills of students. With an approach that not only familiarizes students with real-world problems, but also trains them how to approach and solve them, the college is one-of- its-kind in the district.